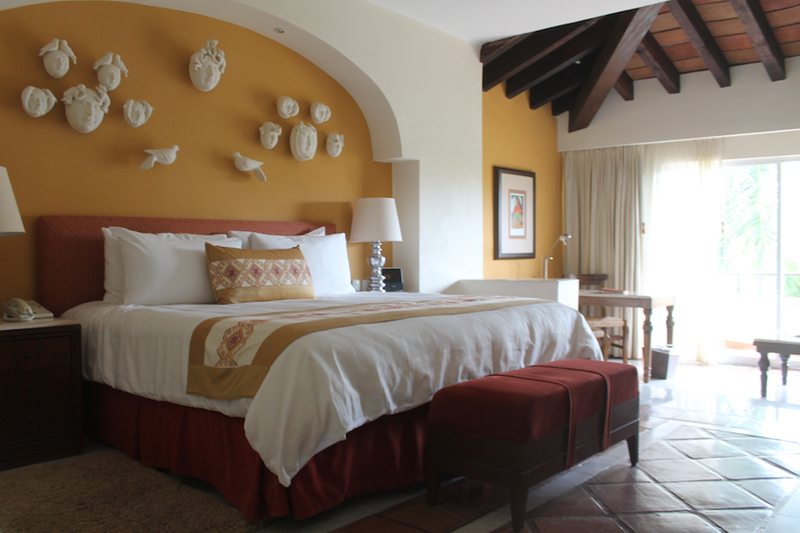 If you want to stay in the heart of gay-friendly Puerto Vallarta, then the Zona Romantica (romantic zone, also known as the old town) is where you’ll want to look for a place to book. Most of the gay venues and hotels can be found here in the rather bohemian beach area of town with cobblestone streets. Everything is walkable here, with many stays along the beach or just a block away. The Olas Altas Suites is a modern, affordable apartment hotel located a block away from the beach in an ideal part of the Romantic Zone – in the central west and across from bars, restaurants, banks, cafes, shops and minutes from the main pier. A perfect hotel for solo travelers and couples looking to exploring different parts of the town and waters, all the apartment rooms feature a fully equipped kitchen, air conditioning and wifi included with the rate, and some of the rooms feature a private balcony. 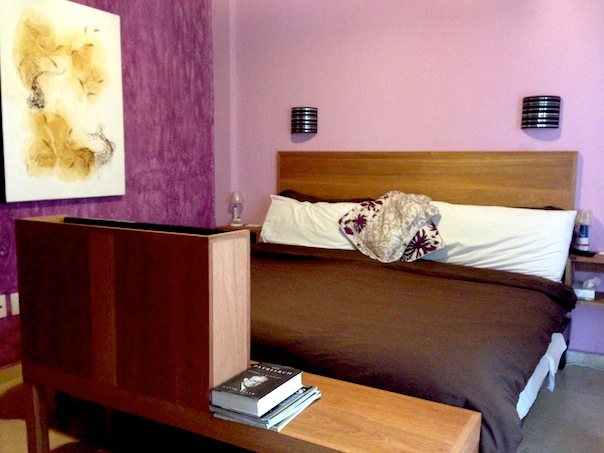 I personally loved the colorful tones used in the bedrooms, the large closet space and local bath products. Make sure to have a dinner at the hotel’s yummy Italian restaurant – Trattoria Michel – on the ground level of the building. If you are looking for a resort stay, there’s a number of options in the marina zone just north of the hotel zone. Among them is Casa Velas, an adults-only luxury boutique resort filled with lush tropical gardens, an oversize swimming pool with plush cabanas, an 18-hole golf course, 80 suites throughout the property, a private ocean club and more. While time at private ocean club and beach is lovely, sometimes mingling in the public beaches can be more fun. For the LGBT part of the beaches on Puerto Vallarta, head to the southern end of Playa Los Muertos in the Romantic Zone. When in the area, head south past the main pier (Los Muertos Pier) and when you stumble upon an area of blue chairs (from the Blue Chairs Beach Club from the resort of the same name), you’ve made it to the original gay beach of PV. 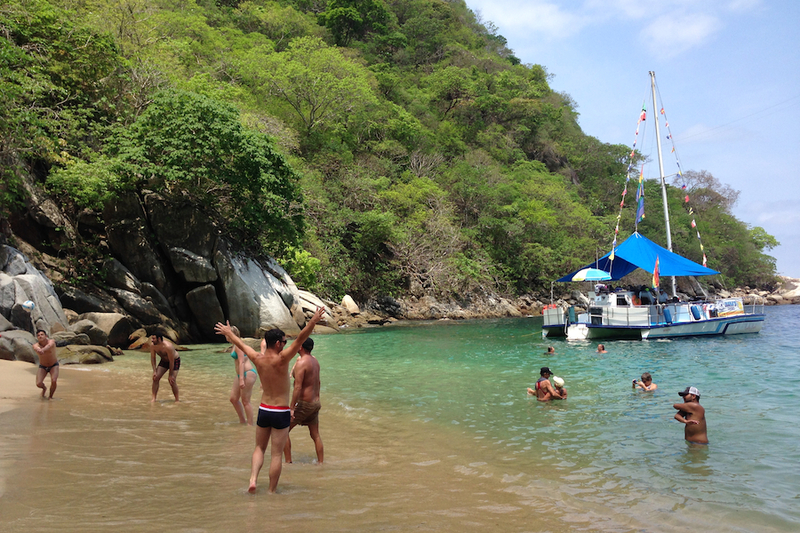 During the day you may also be tempted to take a gay cruise around Banderas Bay. Do it! 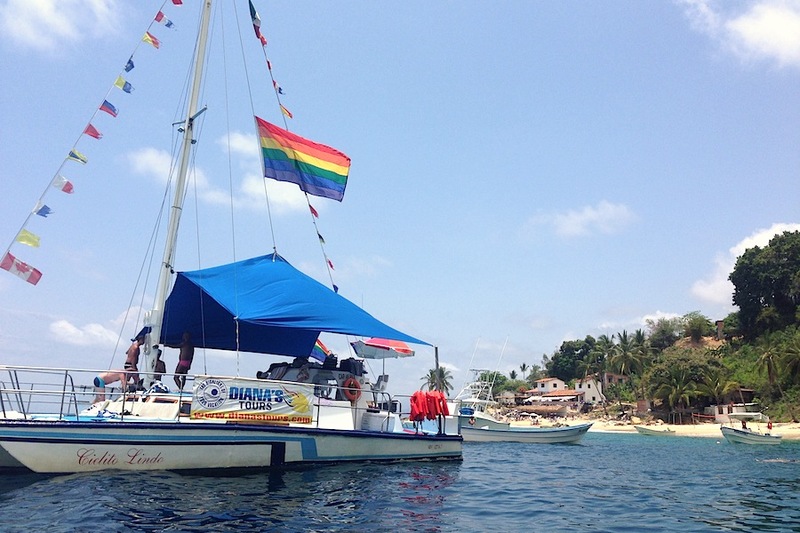 Diana’s Tour is one of the most popular gay cruises and activities in PV, and has been running for 15 years. A full day at sea (which is about $70 USD per person) offers guests a spot on the day’s cruise outing with a snorkeling stop and beach time at Playa Colomitos (main photo above), a continental breakfast and snacks throughout the day, an open bar, an on-shore lunch, and a post cocktail after the cruise at the rooftop lounge of the Blue Chairs. 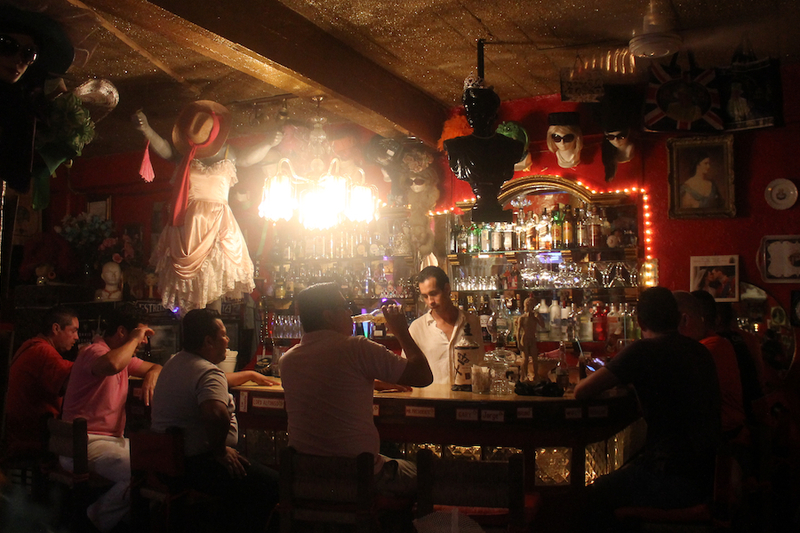 There’s so many gay bars and clubs in Puerto Vallarta to choose from that as a gay nightlife destination on almost on par with areas like West Hollywood or Washington D.C. (if they were given a beach destination makeover). Among the nightlife options is Paco’s Ranch (above), a big dance club with two levels, about three bars and fun drag shows. Another dance club to know is CC Slaughters, which is newer (about four years old now) and offers a massive, multi-level and multi-room dance area and a separate martini lounge option as well. Both of these clubs are across an intersection from each other making bar hopping a blast. For a quainter bar that also caters to older night owls, there’s Reinas (below). Meaning queens in Spanish, the bar is filled to the brim with quirky royal decor, statues and figures, wigs and playful motifs throughout. Posted on May 19, 2015, in Gay Travel and tagged Gay Travel, LGBT, Mexico, Puerto Vallarta, Travel. Bookmark the permalink. Leave a comment.